[/fusion_text][/fusion_builder_column][/fusion_builder_row][/fusion_builder_container][fusion_builder_container hundred_percent=”no” hundred_percent_height=”no” hundred_percent_height_scroll=”no” hundred_percent_height_center_content=”yes” equal_height_columns=”no” menu_anchor=”” hide_on_mobile=”small-visibility,medium-visibility,large-visibility” class=”” id=”” background_color=”” background_image=”” background_position=”center center” background_repeat=”no-repeat” fade=”no” background_parallax=”none” enable_mobile=”no” parallax_speed=”0.3″ video_mp4=”” video_webm=”” video_ogv=”” video_url=”” video_aspect_ratio=”16:9″ video_loop=”yes” video_mute=”yes” video_preview_image=”” border_size=”” border_color=”” border_style=”solid” margin_top=”” margin_bottom=”” padding_top=”” padding_right=”” padding_bottom=”” padding_left=”” admin_label=”Page Content” admin_toggled=”no”][fusion_builder_row][fusion_builder_column type=”1_1″ layout=”1_1″ spacing=”” center_content=”no” link=”” target=”_self” min_height=”” hide_on_mobile=”small-visibility,medium-visibility,large-visibility” class=”” id=”” background_color=”” background_image=”” background_position=”left top” background_repeat=”no-repeat” hover_type=”none” border_size=”0″ border_color=”” border_style=”solid” border_position=”all” padding_top=”” padding_right=”” padding_bottom=”” padding_left=”” dimension_margin=”” animation_type=”” animation_direction=”left” animation_speed=”0.3″ animation_offset=”” last=”no”][fusion_text columns=”” column_min_width=”” column_spacing=”” rule_style=”default” rule_size=”” rule_color=”” class=”” id=””] [fusion_dropcap boxed=”no” boxed_radius=”” class=”” id=”” color=”#000000″]S[/fusion_dropcap]ince they first began dating in college, Julie and Zach Ertz dreamed of one day creating an organization that could help people in need. In 2018, driven by their faith and a desire to use their success as athletes to better the world, they launched the Ertz Family Foundation. 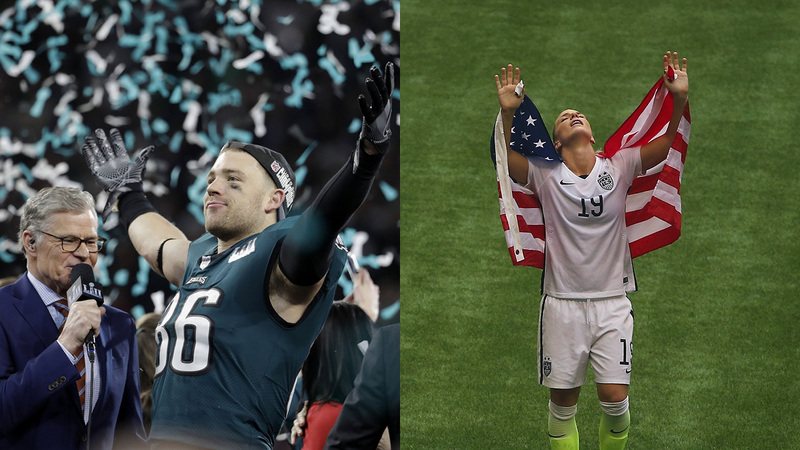 As world champions—Julie as a member of the U.S. Women’s National Soccer Team, Zach as a member of the Philadelphia Eagles—both members of the Ertz family have seen the way that sports can bring people together. They also recognize that with their respective platforms, they can do even more. 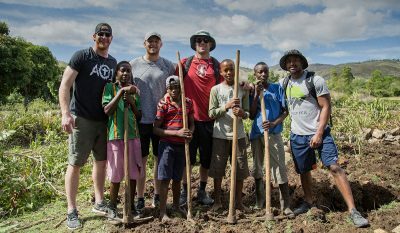 Zach and his Eagles teammates help Haiti youth prepare farmland. A trip Zach took to Haiti with some of his Eagles teammates in spring 2018 opened his eyes to the plight of the less fortunate, and catalyzed Julie and Zach’s decision to launch the foundation. For Zach, the gratitude of the local community—even for things as simple as painting houses—was overwhelming. The experiences he had during the faith-based mission moved him in ways he had never anticipated. Julie meets with a young fan. When Zach returned to America, he shared his experiences with Julie. She saw the way that Zach’s trip to Haiti had impacted him, and knew that the time to launch the foundation had come. Initially, the foundation’s work will focus on Philadelphia, the Bay Area in California and in Haiti, but will eventually expand to other areas domestically and abroad. Zach Ertz, a Pro Bowl tight end for the NFL’s Philadelphia Eagles, scored the winning touchdown in the 2017-18 Super Bowl. 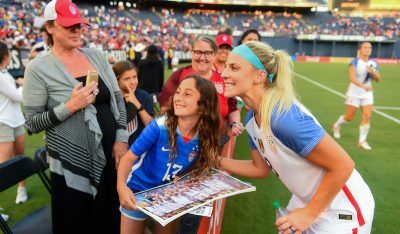 Julie Ertz, a highly decorated defender for the U.S. Women’s National Soccer Team, was a member of the 2015 World Cup championship team, and the 2017 U.S. Soccer Female Player of the Year. The couple met in college when Julie was at Santa Clara University, and Zach was at nearby Stanford. Married in 2017, they share a devotion to their religious faith, a love for athletics and competition, and a desire to help improve the lives of people around the world.